16-year-old Alex is not like other teens. He spends over five hours a day caring for three members of his family. 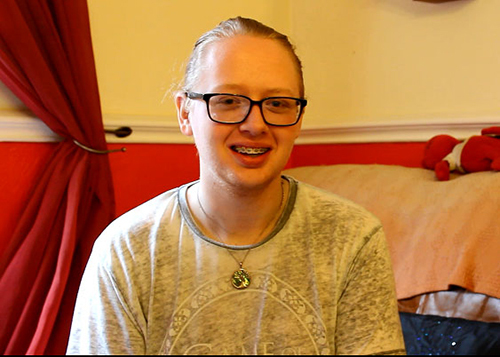 Alex has been a carer since he was just nine years old: his mum has multiple sclerosis (MS); his nan is a double amputee; and his granddad has suffered from a series of strokes. As a young carer, Alex’s caring role is very demanding. In between attending school, he cooks meals, cleans the family home, helps to change his granddad’s dressings, and moves his nan to and from her wheelchair. For many people this would be too much, but Alex is a remarkable teenager. He spends his limited spare time raising awareness of young carers with Spurgeons and he also volunteers for the MS Society – a cause understandably close to his heart. As an advocate for young carers, Alex is part of the young carers committee at Spurgeons. The group discusses issues that are relevant to young carers and the services available to them. As part of this, Alex was involved in a recent consultation at Dudley Metropolitan Borough Council – to review their young carer services. He spoke to them about what was available in the area and took part in focus groups. Alex now plays a huge part in ensuring the right services are available for young carers in Dudley. He has worked with the council to develop resources specifically aimed at young carers, which are now used in schools across the area. After working with the local authority to create a poster to raise awareness of young carers, he has recently been involved with their anti-bullying campaign. In addition to this, Alex speaks at key events addressing commissioners; and in school assemblies, to highlight the efforts of other young carers. When he starts sixth-form college, he plans to introduce a lunch time drop-in session to provide support to other young carers like himself. On top of his other commitments, Alex is a keen volunteer for the MS Society, taking part in fundraising events for the charity. He also offers peer mentoring to fellow young carers and is currently planning a fundraising day for Spurgeons Dudley Young Carers. Despite life being very different to that of his fellow teens, it hasn’t stopped Alex from pursuing his dreams for the future. About to start his A-Levels, he hopes to enter medicine and take his role as a carer to a different level. He’s a perfect example of a teen hero: putting the needs of others above himself and without asking for anything in return. We are proud to know him and he’ll always be a teen hero to us. And, not least, to the family that have come to depend on him so much.